Five years after the worst financial crisis since the Great Depression, we feel fortunate to be where we are. The past few years reinforced the safe-haven status of the United States and the privilege of being the world’s reserve currency. The picture of U.S. economic growth remains modest but steady, with a noteworthy rebound in housing alongside persistently slow-to-recover employment. U.S. stocks cooled from last year’s pace but posted small gains for the quarter. Bonds were among the quarter’s stronger performers, bouncing back after a difficult few months last summer. Global markets experienced an up-and-down quarter but ended mostly positive despite developments such as Russia’s annexation of Crimea. Developed international stocks were flat, largely due to a sizeable decline in Japan. Amidst slow growth but still-high unemployment and very low inflation (and deflation fears), many European markets rose. Emerging markets have been beset by ongoing concerns about economic growth along with macroeconomic instability in countries such as Ukraine and Turkey. These issues were a headwind over the past year and led to a small first quarter loss for emerging-markets stocks. It is important to note the distinction between the short-term news which seems to drive market volatility day to day (and over any given quarter) and the longer-term trends which ultimately drive markets and returns. While we pay attention to the shorter-term news and its effect on markets, we aren’t apt to make adjustments to our longer-term views solely as a result of these often fleeting developments. 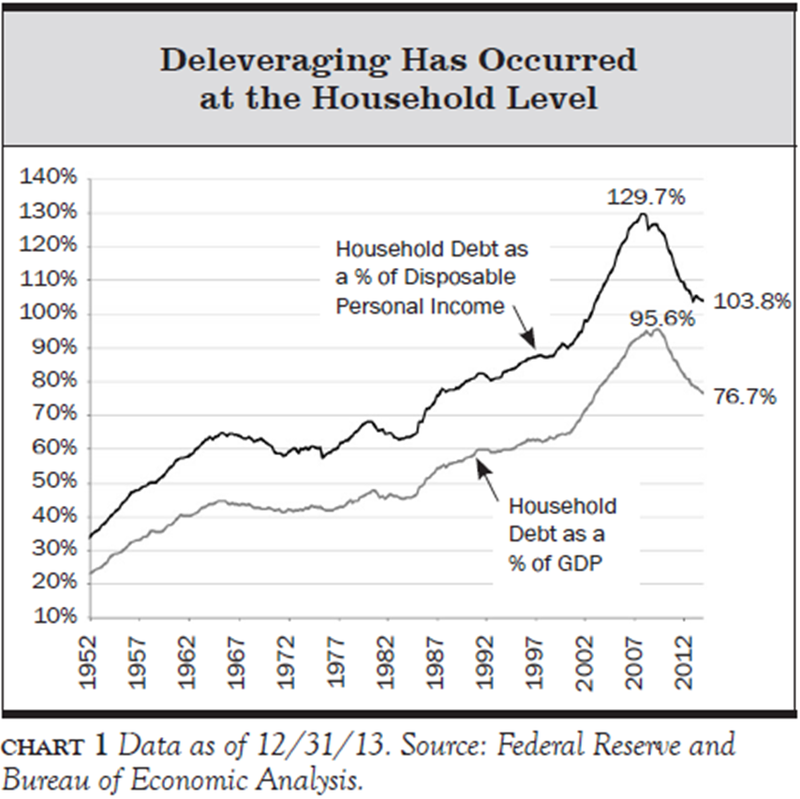 Household deleveraging (paying down debt) is one of those long-term trends that is very healthy, however, it also explains why this economic recovery has been slow/weak. Over the past 60 years, recovery from recession was generally helped by household debt expansion. Simply, households took on more debt to spend beyond their current income thereby helping to create jobs and prosperity. Since 1952 there have been many recessions. The 1970s experienced a severe recession and the chart shows household debt from the late 60s to the early 80s running about flat. Households did not take on more debt in relation to their current income, therefore spending was slower and the recession was longer. During this period, the S&P 500 index returned 0% over the 14 years from September 1968 to August 1982! Now, consider the current environment. The 55-year uptrend of increasing debt is over! For the past five years, households are using more of their income than ever before to pay down debt. While this is very good for the long-run health of our economy, current income that would be spent at retail stores, doing home improvement, or taking vacations is now paying down debt which will not increase jobs and prosperity…in the short run. While household debt expansion helped grow our economy and made past recessions easier, we all know it is not viable in the long-run. However, humans are impatient and none of us are enjoying this economic phase. It is important to remember that, like a teenager, it’s just a phase! The extra dollars spent paying down debt will, at some point, be redirected to spending. It will happen gradually as households start to feel more comfortable with their debt levels, but it will happen. As it does, our stock market will have more room to run! We have frequently written about our focus on good returns and mitigating downside risk, rather than just reaching for high returns. Many strategists overweight stocks even when risks are high. Moreover, in the current period of extremely low interest rates there isn’t a lot of cushion against a recession or an economic shock. Therefore, the need to assess downside risks is greater. These are our foremost considerations as we manage portfolios and work with our clients to achieve their goals.